Many singer/songwriters have nice voices and can sing well but lyrically get mired in the same old topics – tales of love, stories about their somewhat mundane lives and observations of other people’s conditions. Ella Vos, who is bringing her “Watch and Wait Tour” to the Fillmore Philadelphia (1100 Canal Street, Philadelphia, 215-309-0150, www.thefillmorephilly.com) on April 9 is a talented singer/songwriter with a great voice and the ability to write about topics that are not the norm – childbirth, post-partum depression and dealing with cancer and the accompanying chemotherapy. Vos’ new EP – “Watch and Wait” — explores her illness and diagnosis with lymphoma through a deeply personal lens. Building on over 1.5 million Spotify monthly listeners, Vos is known for her dreamy soundscape and songwriting that explores postpartum depression, motherhood and love from a fierce feminist perspective. Vos was discovered by Soundcloud surfers in early 2016 on “Rolling Dice,” a glitchy EDM track produced by Australian DJ/producer Just A Gent. The track reached more than 430,00 spins and gained Vos attention from Rolling Stone and The Line of Best Fit. The song reached the top of Viral charts within two weeks of its debut. The single, which has over 22-million streams on Spotify, was followed by her highly anticipated full-length debut album, “Words I Never Said,” in 2017. In 2018, she teamed with Icona Pop, VÉRITÉ, and Mija to remix “You Don’t Know About Me” in support of the ACLU. In 2017 she toured the U.S. and performed at the Bonnaroo Music Festival. 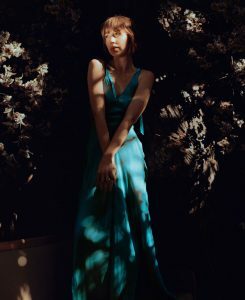 In February 2018 she embarked on the North American “Words I Never Said Tour” with Freya Ridings. “I wrote ‘Watch and Wait’ most of last summer,” said Vos, during a phone interview last week from a tour stop in Dallas, Texas. “I was going through cancer treatment. I started writing the day after I came home. I was actually writing lyrics before that when I was in the treatment room. On this tour, Vos is playing keyboards and singing and is accompanied by Emily Moore on keyboards, guitar, drums and vocals. Vos and keyboards have a long history together. “I grew up just outside L.A. in the high desert – a town near Antelope Valley called Agua Dolce,” said Vos. “Now, I’ve been living in L.A. for a while. Vos explained what caused her to change her mind – and change genres. “I was working on an audition tape for an East Coast school to get my masters in music there,” said Vos. “I ended up spending the summer in a little beach town called Summerland. Some guys I knew kept messaging me to join their band. They sent me tapes and they were so funny on these tapes. “On my 21st birthday, I went down to Orange County and jammed with them in their garage. It was such an opposite from what I was used to. None of them knew anything about music theory. It was so fun and relaxing. They liked how my singing voice sounded. This was a breath of fresh air. Vos left Børns and struck out on her own. “I started working with a producer,” said Vos, whose name means “She You” in Spanish. “I was back in the studio with my son when he was three weeks old. When He was five weeks old, I put out the single ‘White Noise.’ It was my song about post-partum depression. A couple months after I wrote it, I realized what I was going through. “The whole first year was an internal struggle about if I could be honest and open. Now, I’ve opened myself up to being honest and vulnerable. I hope people find their own meanings in my songs. Now, the path of her life has led up to something new – the “Watch and Wait” EP which was just released on January 25. Video link for Ella Vos — https://youtu.be/3Fk_521Twys. The show at the Foundry, which has Clara Mae as the opening act, will start at 8 p.m. Tickets are $16. While Ella Vos eventually moved away from her classical roots, another act performing in the area on April 9 has members who have been players of classical music all their lives. For the 2019-2020 season, Serafin String Quartet will transition to Serafin Ensemble. The new Serafin model offers a greater focus on varied chamber music configurations featuring world class artists who specialize in collaborative arts. 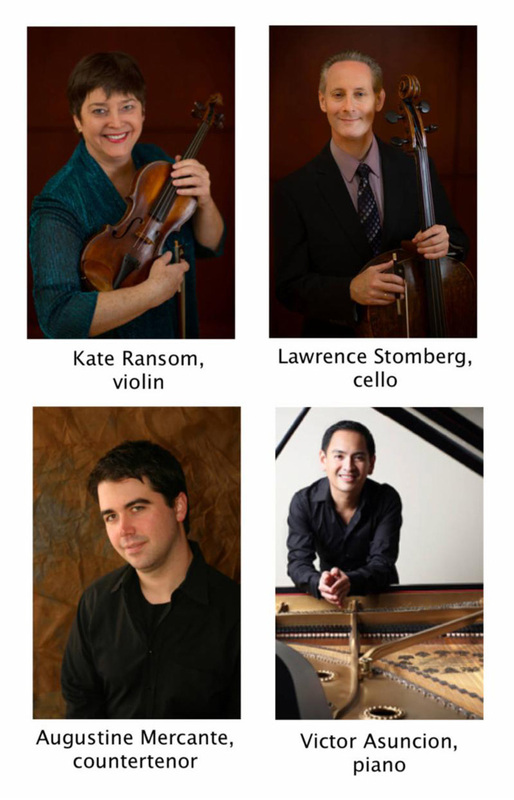 The highly-acclaimed Serafin Ensemble artists performing on April 9 are Augustine Mercante, countertenor, and Victor Asuncion, piano along with Ransom on violin and Stomberg on cello. Ransom and Stomberg are long-time members of Serafin String Quartet and accomplished musicians based in Delaware with roles at The Music School of Delaware and University of Delaware, respectively. Mercante is an acclaimed soloist, Fulbright Scholar and faculty member of The Music School of Delaware and Wesley College. Asuncion is an internationally acclaimed recitalist, concerto soloist and Steinway artist. Hahn “A Chloris” was composed in 1913 by Reynaldo Hahn. This work interweaves voice into the piano accompaniment creating a lovely piece that combines Baroque style with French mélodie. The brief work will be performed in two versions — the original for voice and piano, as well as in a transcription by Anthony Sirianni for violin and piano. “This is sung by Augustine with Victor on piana,” said Ransom, during a phone interview last week. “It’s a beautiful piece in French melodie style – sweet and lovely. It’s a short piece. Chausson’s “Piano Trio in g minor” is a hidden treasure of great beauty and significant craft. The work melds together the rich and virtuosic sounds of piano with dynamic sounds of violin and cello and possesses penchant for the cyclic form known of his mentor and friend César Franck. The concert is a preview of “Serafin Summer Music,” which will run from June 20-30 at The Music School of Delaware in partnership with The University of Delaware Department of Music with sponsorship by William J. Stegeman, Ph.D.
Video link for Serafin String Quartet — https://youtu.be/rcs4SoAOpnA. The show at University of Delaware’s Gore Recital Hall will start at 8 p.m. Tickets are $15 for adults, $10 for seniors, UD staff and alumni, and $5 for students. 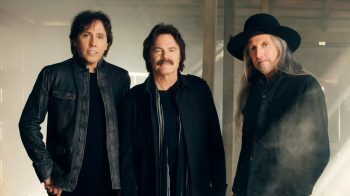 When the Doobie Brothers take the stage at the American Music Theatre (2425 Lincoln Highway East, Lancaster, 800-648-4102, www.AMTshows.com) on April 10, fans can be sure that they are getting the real thing. So often, when bands that were popular in the 1960s and 1970s tour, their links to the original hit-making lineup are weak – at times virtually non-existent…e.g. the Impressions with no original members or the Yardbirds with just the original drummer. The Doobie Brothers’ long career can be broken into three parts: pre-Michael McDonald era, the Michael McDonald era and post-Michael McDonald era. Prior to McDonald joining the group in 1975, the Doobies were a power-chord rocking band best known for “Long Train Runnin’” and “Black Water.” After McDonald joined, they became one of the biggest pop groups in the world with a Number One song (“What a Fool Believes”) and a Number one album (“Minute by Minute”). Numerous members over the years have included guitarists and singers Patrick Simmons and Tom Johnston, who have anchored the band before and after McDonald. After breaking up in 1983, they got back together in 1988 and have been around ever since. The current line-up features Patrick Simmons – Guitars/Vocals; Tom Johnston – Guitars/Vocals; John McFee – Guitars, Pedal Steel, Dobro, Fiddle, Vocals; Bill Payne – Keyboards; Marc Russo – Saxophone; Ed Toth – Drums; and John Cowan – Bass/Vocals. “Pat and I are original members,” said Johnston, during a phone interview last week from his home in Marin County, California. “I’ve been in the band the whole time except for a period from 1982-1987. I did solo work from 1977-1987 and had a few solo albums. Johnston joined the Doobie Brothers when they reunited for a brief tour in 1987 to benefit The National Veterans Foundation. This event led to the permanent reformation of the band, with Johnston again performing alongside co-founder Simmons. Johnston co-wrote, sang and contributed a signature guitar solo to the group’s last major chart hit, “The Doctor” from 1998’s “Cycles” album. “We came back in 1987 for the Vietnam veterans show,” said Johnston. “In 1989, the original configuration got back together. We released the ‘Cycles’ album and the ‘Brotherhood’ album on Capitol Records. Everything before that had been on Warner Bros. Records. When they started in Northern California in the late 1960s, The Doobie Brothers’ rugged, real and authentic approach to rock and roll made them biker bar stalwarts. But their self-titled debut album in ’71 went beyond just leather and motorcycles, revealing even more musical layers — sweet three-part harmonies and rootsy, introspective, acoustic flavors. It all began in 1969, when a drummer named John Hartman arrived in Northern California. He was there to meet Skip Spence from the band Moby Grape and become part of a supposed band reunion that never quite got off the ground. But it wasn’t all for naught. Spence (who had also played in the Jefferson Airplane) introduced Hartman to his friend Tom Johnston, a local singer/songwriter/guitarist, and they connected. Hartman and Johnston began playing local Bay Area bars. They soon met singer/guitarist Pat Simmons, whose finger-style playing richly complimented Johnston’s R&B strumming-style, and the foundation for The Doobie Brothers was set. The Doobie Brothers’’ debut album in 1971 did not chart. But one year later, their second record, “Toulouse Street,” became a breakout sensation. Producer Ted Templeman helped the band craft a sound that was organic, yet radio friendly, and brought in Little Feat keyboardist Bill Payne to add unique musical textures. Payne is now a member of the 2019 edition of the Doobie Brothers. In 1974, Steely Dan co-lead guitarist and session legend Jeff “Skunk” Baxter joined the band as third guitarist. The group’s expanded lineup was augmented in 1975 by Michael McDonald, whose soulful vocals and songwriting led to the hits “What a Fool Believes,” “Minute by Minute,” “Takin’ It To The Streets,” and “You Belong To Me.” Multi-instrumentalist and vocalist, John McFee, joined in 1978 bringing his wide range of musical styles and experience recording with Van Morrison, Steve Miller, Elvis Costello, and The Grateful Dead to The Doobies’ sound. Continuing to record, The Doobies released “World Gone Crazy” in 2010, produced by Ted Templeman, and “Southbound” on Arista Nashville in 2014. “Southbound,” produced by David Huff, featured new recordings of the band’s iconic hits, with country music’s biggest stars including Blake Shelton, Zac Brown Band, Brad Paisley, and Toby Keith. The Doobie Brothers were inducted into the Vocal Group Hall of Fame in 2004, have won four GRAMMY® Awards and sold more than 48 million records worldwide (including three multi-platinum, seven platinum, and 14 gold albums). Their 1976 “Best of the Doobies” has sold more than 12 million copies, earning rare RIAA Diamond status. According to Johnston, “We’re basically an American band – we cover a lot of areas. We cover blues, R&B, country, bluegrass, and rock-and-roll. It’s based on rhythms, rhythm structures, picking, and harmonies. That’s been the signature of the band. Their music has proven to be relatable for generations since they first came together, which is why they continue to make new music. Video link for the Doobie Brothers – https://youtu.be/q-ef6erqYw8. The show at to the American Music Theatre will start at 7:30 p.m. Ticket prices are — Tier 1: $135; Tier 2: $125; Tier 3: $115. Two bands playing the area on April 10 are at opposite ends of the spectrum when it comes to longevity. The Doobie Brothers will soon be celebrating their 50th anniversary. Juice, which is headlining a show at the World Café Live (3025 Walnut Street, Philadelphia, 215-222-1400, www.worldcafelive.com), just celebrated its fifth anniversary. Juice is an American rock band formed in Boston, Massachusetts in 2013. The band consists of Ben Stevens (lead vocals), Christian Rose (violin, vocals), Kamau Burton (acoustic guitar, vocals), Daniel Moss (guitar), Michael Ricciardulli (guitar), Rami El-Abidin (bass), Miles Clyatt (drums). Juice draws from many influences, including rock, pop, hip-hop, and R&B. “We first met at Boston College,” said Moss, during a phone interview last week during a tour stop in Charlotte, North Carolina. “We were all in the same year. Me, Ben and Mike were on the same floor in a dorm. The other guys were together in another dorm on campus. “It was kind of a stroke of luck – same year, same lodging. We had a couple guys who were minoring in music but no music majors. I lived with the drummer and we found our violin player on Facebook. We slowly just found each other. There’s not a lot of music at B.C. so most musicians knew each other. While in college, the members of Juice performed regularly in Boston and New York City. In 2016, Juice released a self-titled EP after a successful crowd-funding campaign. In July 2106, Juice won the “Land the Big Gig Competition at Summerfest” in Milwaukee, Wisconsin. At the big annual festival in the land of cheese, the band was introduced to producer Johnny K, who invited the band to record an EP the following summer. Juice released its debut EP, “Workin’ on Lovin’,” in June 2018. Juice blends several genres, including rock, pop, hip-hop, and R&B. Each member draws on a diverse array of influences. With three vocalists, Juice is known to incorporate elaborate harmonies. Juice also incorporates extended electric violin and guitar solos in their live performance. Through constant gigging Juice honed their live performance, displaying an original raw energy. Soon, Juice went from frequent gigs at the city’s famed Middle East to selling out East Coast hotspots such as Brighton Music Hall, Mercury Lounge, Rockwood Music Hall, and more. “When we first started, our first 10 shows were around the campus,” said Moss, a native of Milwaukee. “The Middle East club in Boston was our first off-campus gig. 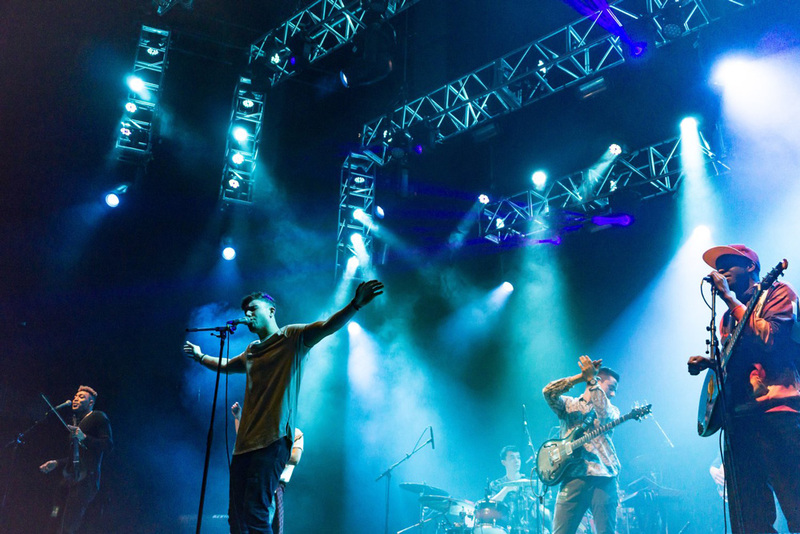 We caught the eye of a promoter in Boston and within a year-and-a-half, we were going down to New York City for shows. Video link for Juice – https://youtu.be/AI2fULLtSSk. The show at the World Café Live, which has Z by Z and Dylan Dunlap as opening acts, will start at 8 p.m. Tickets are $10.